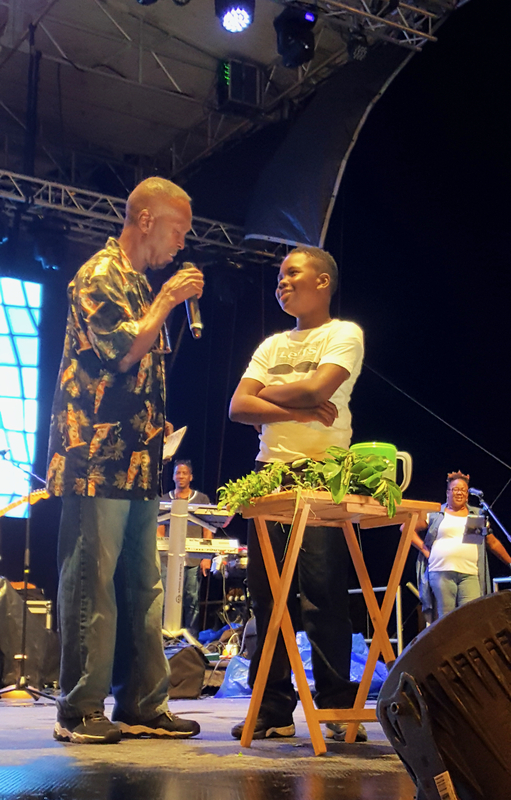 The Crucian Christmas Festival Village, named the Irmaria Stress Free Zone, came alive with the sounds of children pursuing their passion of song Saturday night as the Junior Calypso Review took to the stage. Under the tutelage of King Derby, also known as Camille Macedon, 10 youngsters entertained the crowd with their singing prowess, lyrics and dance. 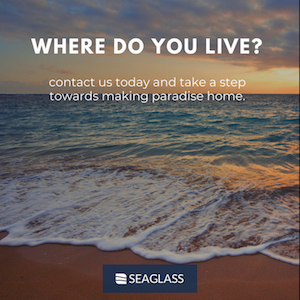 The yearly event is usually held as a contest, awarding the winner the prestigious title of Junior Calypso King or Queen and attracts young people from the local elementary schools. But because the territory was devastated by Hurricanes Irma and Maria, King Derby said he was not able to go to the classrooms and give the children the benefit of the entire program. “The children only had one rehearsal in December, but I am very, very pleased with the results tonight”, he said following the performances. He said this year has been very rough because of the hurricane and split sessions in the schools. Quesmanyo Jean get some pointers from King Derby following his performance. With King Derby’s guidance the singers receive voice lessons, taught to compose music, to rhyme and create a melody. They also learn cord structure on a banjo. One by one, with generous applause and appreciation from the audience, the little singers poured their heart out in songs that reflected their lives. One of the two girls who came to the stage, 12-year-old Isabel Terrado, sang about her love for the rain, sunlight and the moon. In a clear, strong, melodic voice she told about her hopes to vacation on the moon one day. 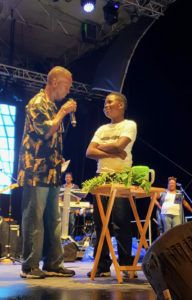 Quesmanyo Jean, already a calypso veteran with a first-place win from his junior high school this year, sang about his grandmother curing all his ailments with bush tea. “My grandmother gives me bush tea when I am feeling bad, moringa, senna, ginger thomas, lemon grass and rosemary. That keeps me healthy.” He showed the audience samples of the various bushes and drank from a pitcher of tea. If a singer was nervous on stage, King Derby would stand beside him or her and encourage them. Several got to perform their song a second time when the first time did not come out quite right. Derby said those with the most potential he follows, teaches and mentors all through elementary, junior high and high school. Several of his protégées grew up to be professionals in the music business. Sitting with the King during the interview, young people were constantly greeting him and coming for a quick hug. He told one young lady, “You coming to sing next year?” She gave him a shy smile. Derby is obviously admired and respected by the children he mentors. After all he has been doing this for more than 40 years. The official opening night of the village is December 26. Fireworks will explode at 8 p.m. from the Frederiksted pier. The entire Festival schedule is online at www.stxfestival.com.